Yesterday I was at the grocery store with a friend, trying to pick out a snack for that evening's small group meeting. I wanted to grab some apples and caramel dipping sauce, so I headed for the produce section. When my roommate buys apples, she always mentions that I should grab the bag of apples because it's cheaper. I inspected the prices of apples per pound and found that she was indeed correct. A bag of apples was $1.19 per pound verses non-bagged apples ranging from $1.49 (red delicious, which consequently are genetically altered and offer less nutrition) to $1.99 per pound, which was the average. I stared at the huge bag of apples and after weighing them and doing the math, I realized I would have too many apples and paid over $7 for the bagged apples...I really only needed about 10. This was a problem. I hate paying too much for stuff, so I stared at the problem hoping it would go away. 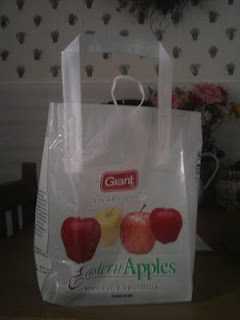 Luckily, the friend who was with me, suggested that since the price was per pound that I remove apples from the bag, dispersing them into other bags. Genius! I took out the apples I didn't need and I got only the amount I needed. I'm not sure this is really the purpose of these produce bags. I think the idea is you buy them in bulk so you pay less, but since I went through self-checkout line, I was safe from reprimand. Now I wonder if there are other ways I can capitalize on this new-found-knowledge in other produce sections or aisles in the grocery store. I will have to keep my eyes open on my visit.